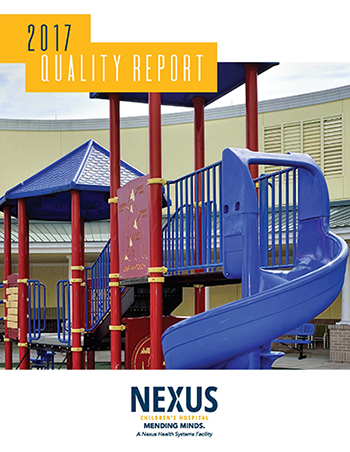 The focus of Nexus Children’s Hospital’s rehabilitation is to maximize our patients’ functional independence while providing necessary education to families leading up to the return to home and school. Physical Therapists (PT), Occupational Therapists (OT), and Speech-Language Pathologists (SLP) participate in the care of our patients at all levels of care with the valued input from the entire medical team. Nexus’ medical team has experience in doctorate level teaching at local universities, professional-level continuing education instruction and graduate level clinical rotation mentoring. Our therapists have specialized training in identifying each child’s needs to implement an individualized care plan. Our PT program treats the whole child and their individual needs, and focuses on recovery to get back to school, sports, and home. The team focuses on functional limitations as a result of the child’s diagnosis. Our physical therapists are experienced in Neuro Developmental Treatment (NDT), Proprioceptive Neuromuscular Facilitation (PNF), and a variety of other developmental instruments. They understand the physical and mental challenges a child can face during the recovery process. They work with other team members and families to help each child achieve his or her optimal developmental and functional levels. Our team focuses on providing communication skills and tools to children and adolescents with speech, language, swallowing, and communication difficulties. Nexus’ speech-language pathologists work together with the child and family forming a therapy partnership to achieve goals and deliver an unparalleled level of speech and language treatment in a warm, friendly, and comfortable environment. Our Occupational Therapy Services provides opportunities for children to redevelop skills for playing, school performance, and daily activities according to what is developmentally appropriate for the child’s age group. The OT staff is trained in Neuro Developmental Treatment (NDT), Proprioceptive Neuromuscular Facilitation (PNF), and a variety of developmental instruments. These therapy modalities aim to provide a child with the skills necessary to achieve independence in all areas of their lives, both cognitive and physical; enhancing a child’s motor skills while enhancing their self-esteem, sense of accomplishment, and independence.